The Sengoku Period (戦国時代) was also known as the Warring States period and lasted from 1467, the beginning of the Ōnin War (応仁の乱 Ōnin no Ran), until 1568, when Oda Nobunaga entered Kyōto to assert national hegemony. Some historians date it from 1490, when Hosokawa Katsumoto (細川 勝元, 1430-1473), the kanrei (管領, shogunal deputy), took over the actual power of the Muromachi shogunate, others from 1491, when Hōjō Sōun (北条 早雲, 1432-1519) conquered Izu Province (modern-day Shizuoka Prefecture) and began to rise to control over the Kantō region. Although the Sengoku Period is often described as a transitional period between medieval and premodern ages, most historians regard it as the final stage of Japan’s middle ages. As a result of weakening shogunal leadership, local shugodai (守護代, deputy military governors) and kokujin (国人, local military proprietors) established military and political control over provinces that had previously been ruled by the great shugo (守護, military governor) houses. The imperial court, the Ashikaga shōgun, the shugo based in Kyōto, and temples found themselves powerless against this new group of local rulers, called Sengoku daimyō. These regional warlords waged constant war to defend or enlarge their domains. Only in the 1560s did Oda Nobunaga succeed in defeating his competitors and emerged as a potential national unifier of Japan. Despite political instability, the Sengoku period saw remarkable economic growth: the Sengoku daimyō worked to enrich their domains, build up their armies and implemented flood control and land reclamation projects; agriculture expanded, and rice harvests increased substantially, as did the production of raw materials for handicraft industries. The mining industry witnessed a veritable boom, with many new mines opened for the production of gold, silver, copper, and iron, furthering, in turn, the development of smiths and foundries. The cotton industry also had its beginnings in this period. Before that time all cotton yam and cloth had been imported, but the cultivation of cotton started in Mikawa Province (a part of modern-day Aichi Prefecture) around this time, leading to the production of domestic yam and cloth, with cotton cloth becoming the principal fabric of the premodern period. 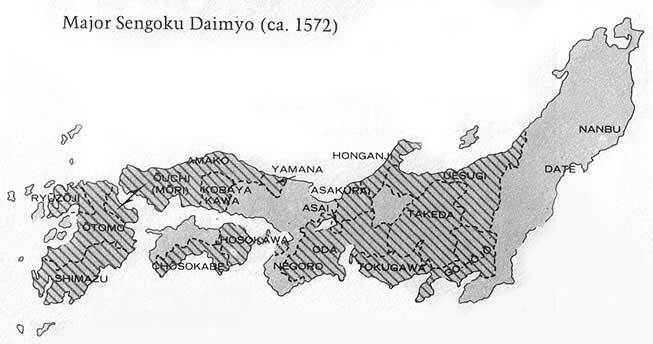 Along with industrial development, commerce also expanded, too: numerous stores were established in towns and along heavily travelled roads, boat transportation flourished, and the daimyō were able to trade with distant provinces. The increase in trade over a wide area resulted in the formation of commercial cities, where commodities were collected and distributed. Representative towns were Sakai, Hyōgo (now Kobe), Kuwana, and Hakata. With the end of the Ōnin War, Kyōto, a battlefield of eleven years, regained its former importance as the industrial and commercial centre of Japan. Influential merchants managed the affairs of these cities and towns and attained a degree of political autonomy, defending them in cooperation with the ordinary citizenry. Christian missionaries in Sakai at the time were struck with the similarities between Sakai and the free cities of medieval Europe. During the later Sengoku Period, castle towns grew up around the castles of influential daimyō and served as political and commercial centres. Another paradoxical development during the century of civil war was the nationwide diffusion of culture, formerly the prerogative of the nobility and clergy in Kyōto and Nara. A significant role in this process was played by Zen priests and rengashi (連歌師, linked-verse poets) who were invited to the provinces by the Sengoku daimyō. The Zen priests taught Confucianism, classical Chinese poetry (漢詩 kanshi), and ink painting and were also influential in the publication of various books. The rengashi taught renga and haikai (俳諧 or 誹諧, humorous or vulgar renga poetry) and the Japanese classics. Under the patronage of the wealthy merchants of Sakai and Kyōto, who were themselves outstanding practitioners, the traditional arts, the tea ceremony, no, and various types of music flourished. Books aimed at the general public, like Otogi-zoshi (お伽草子, collections of moralistic stories) and the kanginshu (感吟, a collection of popular songs), were published. The setsūyoshū (節用集), a dictionary for everyday use compiled by Zen priests, was also published. Christianity was introduced to Japan by Francis Xavier in 1549. He and his fellow missionaries also brought with them European, or namban (南蛮, “southern barbarian”), culture. Thanks for the info man, very informative. hey I’m a student doing a paper on the Warring States Period and I have a few questions if you don’t mind answering them. Very nice article by the way. Thanks, we appreciate it! Shoot away, although we're armchair historians at best. Thank you. Who was the first sengoku daimyo? Megan, it really depends on what you view as the beginning of the Sengoku period: the year 1467, the outbreak of the Ōnin War, or the years 1490/91. Notable families of shugo daimyō rank were the Takeda, Shimazu, Ogasawara, Imagawa, Ōuchi, Satake, Toki, Rokkaku, Ōtomo, Hosokawa, and others. Those clans were all active around that period, so I believe there’s no way of saying who can be counted as the “first sengoku daimyō”. I am an author writing my first book, and I settled upon the idea to use historical fiction. I'm also going to use some stuff with permission from a popular franchise of video games and movies. This franchise led to some nice literary inspiration, actually. I was wondering if you had any advice and any suggestions as to further resources I might could use. What's your story's background and what era will it be settled in?